The Shiba Inu (柴犬, Shiba Inu? also called the Shiba Ken) is the smallest of the six original and distinct breeds of dog from Japan. A small, agile dog that copes very well with mountainous terrain, the Shiba Inu was originally bred for hunting. 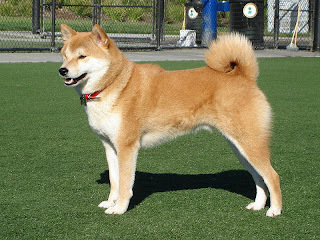 It is similar in appearance to the Akita, though much smaller in stature. Inu is the Japanese word for dog, but the origin of the prefix "Shiba" is less clear. The word shiba usually refers to a type of red shrub. This leads some to believe that the Shiba was named with this in mind, either because the dogs were used to hunt in wild shrubs, or because the most common color of the Shiba Inu is a red color similar to that of the shrubs. However, in old Japanese, the word shiba also had the meaning of "small", thus this might be a reference to the dog's small size. Therefore, the Shiba Inu is sometimes translated as "Little Brushwood Dog"
http://www.Japan-Domains.net - Make Money Now!